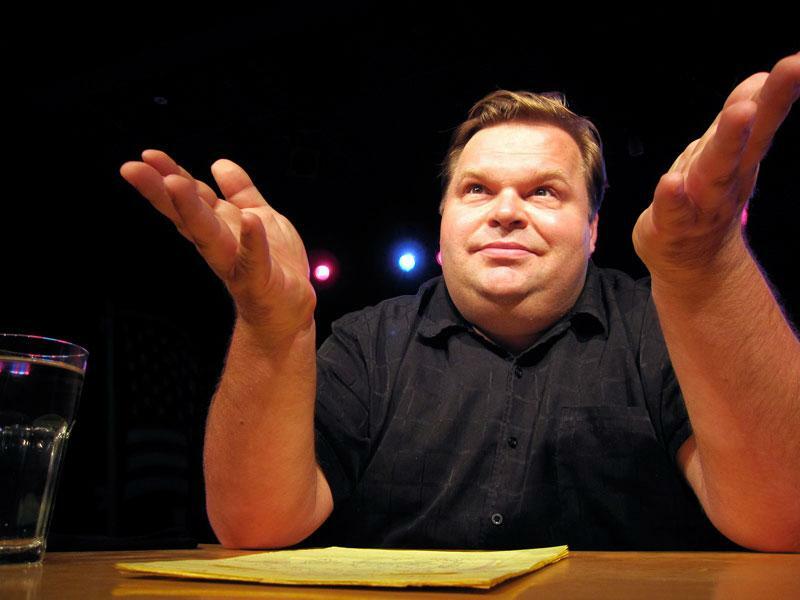 Back in November, theatrical performer Mike Daisey was given the opportunity to write about Apple in the Technology section of the The Guardian. He's now claiming "reverse claim chowder," insisting that some of what he wrote about actually turned out to be true, given Apple's recent earnings report showing the first decrease in year-over-year, quarterly iPhone revenues. That's not true at all. AppleInsider fact-checked Daisey's original piece and pointed out that every material claim he made was a mixture of ignorant conjecture and simpleton fallacy. Daisey is the man who so boldly and outrageously lied about Apple's factory conditions in China that "This American Life" issued an apology for giving him airtime and the New York Times had to retract claims Daisey made of personal experiences that turned out to be completely fabricated lies. After being outed by fact-checkers, he eventually apologized to the journalists he lied to, explaining that, "things came out of my mouth that just weren't true, and over time, I couldn't even hear the difference myself." Today however, Daisey is now claiming that the "sneering disdain--thousands and thousands of words were spent mocking me" that he received in response to, as he writes, what "was, I thought, a measured piece," was actually misplaced, and that he should be credited with predicting Apple's March quarter decrease in revenues. "The level of anger and vitriol was actually a clue to the fact that what I'd written struck close to home," Daisey wrote. Like everything else he has written, however, there's little truth in that. Daisey wasn't persecuted for criticizing Apple. He was called out by a variety of sources for making claims that were factually untrue. Daisey is now claiming that Apple's recent earnings report somehow vindicated his earlier writing, stating that "six months earlier it was unthinkable and anathema" that Apple's earnings could fall in the March quarter. That's not true. In fact, Daisey's original article was written in response to Apple's previous quarterly earnings report, where Katy Huberty of Morgan Stanley raised the question of "increasingly tough comps heading into the March quarter" and the prospect of Apple being "on the verge of ex-growth for the first time in a decade." The prospect of Apple's iPhone 6s cycle falling short of the mega cycle upgrade stoked by iPhone 6 models in the previous year was widely talked about even before the Q4 call. In the following quarter, Apple laid out clear guidance of where it believed it would be heading in the March quarter. Apple's chief financial officer Luca Maestri unequivocally stated, "We expect revenue to be between $50 and $53 billion. We are providing a wider range for revenue than usual for the second quarter because of the volatility we are seeing in the economy and in the financial and currency markets." He also answered an analyst question, stating that, "in constant currency, when you look at it, for the March quarter, revenue would be down between 5 and 10 percent." Sure enough, Apple reported $50.557 billion in revenues for the quarter. A potential revenue decrease in the March quarter was not an "unthinkable and anathema" idea. In contrast, a wide variety of media sources reported, based on supply chain rumors, that Apple had supposedly cut December production by 10 percent and that Apple was expected to reduce supply by 30 percent in the March quarter. Those are far larger decreases than Apple subsequently reported for either quarter. There was no decrease in December, and nowhere near a 30 percent decrease in iPhones during the March quarter. However, those stories were played non-stop over the last two quarters, making it absurdly ridiculously for Daisey to now claim that anyone actually expected iPhone 6s to surpass the iPhone 6 upgrade cycle during the March quarter. Nobody can now pretend that anyone with any interest in Apple's financials was "surprised" to see the company perform exactly as it declared it would last quarter. On top of that, Daisey's predictions of doom for Apple were not based on anything real. If a person predicts their friend will die from eating GMO food, but it turns out that the person is killed by a train instead, the original prediction is not accurate, just because a death did occur. That incorrect prediction also offers nothing to prove by itself that GMO food is dangerous. Daisey originally referred to Apple's "ever-increasing, ever-impressive numbers" as a "narrative," as if the company had been hiding real failure behind a phony facade of success. That's not true. The other major reason was that Apple (and all other American companies doing business globally) was hurt by unfavorable exchange rates around the world due to the strength of the U.S. dollar. Daisey didn't identify either of those real problems in erecting his story of impending doom for Apple. Instead, he claimed that iPhone sales were already too low six months ago and that the company had failed to exceed its previous guidance. But that wasn't true. At the same time, Daisey also claimed that Apple was in trouble because the largest share of its revenues come from one product. This, too, is neither an original idea nor even functionally accurate. Virtually all of Google's revenues come from ads. If Tesla were making money, all of its revenues would be dependent upon one product: an electric vehicle with four tires. Microsoft--one of the most successful companies in tech history--has also earned virtually all of its revenues and profits from sales of one product: software licensing--across decades. There has never been a real problem with making most of your money in one place, when that place is the only one capable of delivering incredible amounts of money, the way smartphones have since the release of iPhone. A much larger problem would be watching Apple earn so much money from iPhones while you're unable to, such as Google making virtually nothing on Android, or Microsoft losing money from Windows Mobile, or Amazon investing in the Fire Phone failure, or Blackberry and Nokia failing to hold on to early leads in the smartphone space. Or Samsung watching as its once large Galaxy business was smashed by the arrival of iPhone 6. Those are all major problems for those companies, not for Apple. Apple's incredible iPhone 6 sales throughout the fiscal 2015 upgrade surge during relatively favorable economic conditions were not a problem for the company. It's the very reason why Apple has so much cash in the bank, available to invest in the future while its rivals all face the same current challenges in a worsening macroeconomic climate. Daisey's original article of impending doom also claimed that Apple Watch was doing so poorly that "very little was said at the last quarterly phone call," a claim that was also not true. In fact, Cook provided more details about Apple Watch software during the call than he covered for other products Apple sells, including iPhone. Daisey claimed that iPad was "once spoken of [by Apple] as the post-PC device that would change the nature of computing forever, now that it has been selling less and less of them this kind of revolutionary rhetoric has vanished," but that's not true either. A quarter ago, Cook introduced the new iPad Pro, boasting it up as "the most powerful iPad we've ever made," and stating "iPad Pro will enable a new generation of apps for entertainment and productivity, design and illustration, engineering and medical, and much more." Apple has since continued to invest in iPad Pro, prominently marketing it as "the ultimate PC replacement." One can take issue with whether they'd prefer to use a conventional laptop computer over an iPad, but to claim that Apple's "revolutionary rhetoric has vanished" is simply not true at all. Apple is actively driving iPad adoption in Enterprise as a revolutionary mobile PC, and noted that "IDC indicates that iPad accounts for 72% of the U.S. commercial tablet market, comprising business, government, and education," while adding that "NPD indicates that iPad has 78% share of the U.S. market for tablets priced above $200." While claiming that the company was too dependent upon iPhones, Daisy also criticized Apple for significantly expanding its sales from non-hardware Services, which delivered a primary bright spot of optimism during an otherwise difficult quarter: growing 20 percent annually to deliver $6 billion in bookable revenues. Services actually brought in $10 billion in revenues this quarter, before Apple delivered $4 billion of that to its content partners. Apple makes so much real money that it doesn't have to massage its numbers to look better than they are, so it only books Services revenue using the money it actually takes away from its online operations, not the full amount it collects. In its most recent earnings call, Apple noted that its profit margins from Services are significantly higher than its other sales. Daisey further claimed that "the longer that [iPhone] is Apple's only crown jewel the better the chance they will be disrupted," which is incorrect on multiple levels. First of all, Apple has a series of crown jewels: a $23.2 billion iPad business, a $25.5 billion Mac business, a $20 billion Services segment, and that $10 billion Other Products category that includes Apple TV, Beats, iPods, accessories and Apple Watch. There is no hint of anything disrupting Apple's current businesses. And if some disruptive new product category were to materialize, no company would be better positioned to capitalize on the opportunity than Apple, given its size, capital, connections and talent pool. Secondly, there is no increase in the "chance" of disruption based on size. All the attempts to kill iPhones sales have failed regards of whether they were from larger phone companies (Nokia, Microsoft) or smaller ones (Palm, Amazon) than Apple. This just played out in tablets and again in watches, where Apple created a wearables business in one year that's now a billion dollars larger than Rolex and by far the largest and most valuable among other smartwatch vendors. This quarter, Apple's Other sales increased by 30 percent, growth that the company attributed to Apple Watch. Apple's current earnings would nothing short of incredible had the company not enjoyed an even more spectacular iPhone 6 cycle last year. That's no basis for suggesting that the company is troubled, regardless of the web of fallacies a literary artist can spin.